There are two forms of simplicity, the good kind, and the bad kind. Each of us sees the varying forms of simplicity in their own way and judge games according to their own viewpoint, in my books the bad kind of simplicity is the tiresome gameplay of most mobile games, but the good kind is always something special. Thomas was Alone is the good kind of simplicity, this game is a showing of how something that looks so simple, basic and like nobody put any real effort into it can surprise you and truly develop into something great, something memorable. Before playing this game, if somebody had asked me if I thought a game about squares and rectangles could be enjoyable, I would have answered no, however, after seeing how special this game is, I admire the simple design and just how well built this all turns out to be. On the surface, Thomas was Alone is a very basic looking game about shapes moving from one point to another, but this is a time where you need to look deeper to see the true greatness of the game. 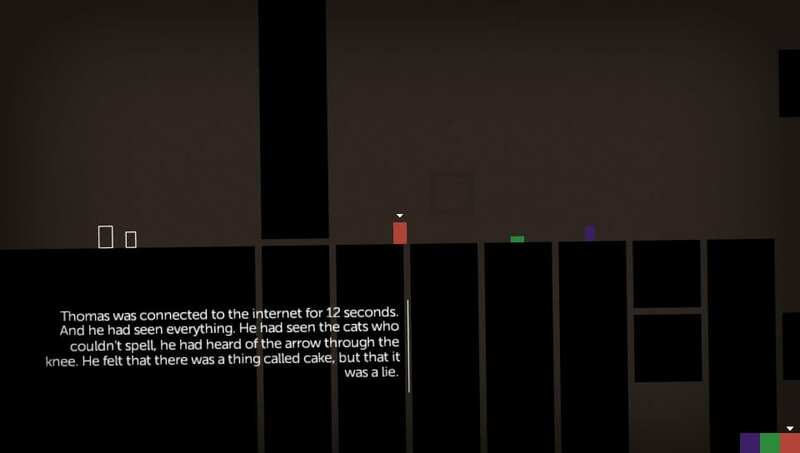 Thomas was Alone tells the surprisingly deep and compelling tale of Thomas and his friends, through some seemingly random event these AI gain sense of self and set out on a journey across the dataspace. Their journey is littered with observations, deep storytelling and many perils and through simple means the game urges you to care about something as simple as a little red square, the character’s journey turns into something truly memorable as they set out to change things for the future. Notably, this game is a huge liar, the title Thomas was Alone is clearly used to help draw people in with an interesting and driven title, in actual fact the character, Thomas is only a small part of a much greater tale but the title does play into the game well. Even despite this point, Thomas is still a central character in this journey and plays a key role in the events that occur. 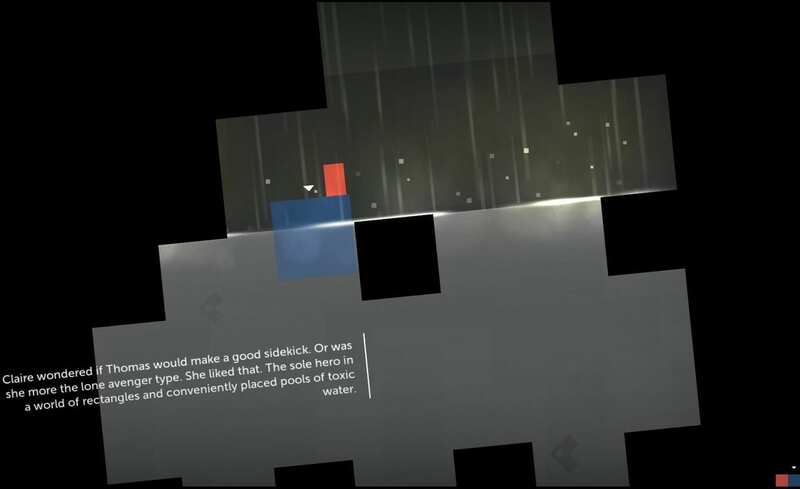 Thomas was Alone is a game about squares and rectangles on a journey through the dataspace, just seeing this game does not really show why this is so special and like many simple games, it really begs you to play and experience. What may look like a simple game may never develop beyond its 2D roots, but really develops into something truly thoughtful that shows simplicity does not mean bad. This game starts with the lone character, Thomas coming to terms with his existence and excitedly venturing forward making simple observations. Thomas is your basic character, he has no discernible talents, nor does he have any weaknesses. We simply move him to the exit point of each level, making our way around the obstacles. This early game is pretty tedious as no real problems arise, thankfully the game quickly evolves and develops into a great adventure as new characters arrive. The story holds no central focus on any one character and this means where one minute we can be following the exploits of Thomas, the next we are hearing the thoughts of an entirely new character. This dynamic I felt was clever, as I wandered forward I never was able to grow tired of a single character because of their story, the game further develops each story as the game progresses without ever droning on. But this is the benefit of the characters in general, where Thomas is the neutral character, we see others with their own unique abilities as well as strengths and weaknesses which pushes the gameplay and forces you to think. Different abilities are experimented with throughout the game and push the boundaries of the linear levels, pushing through the game we are forced to help a weaker character by the name of Chris reach higher platforms and this then involves utilizing the varying heights and abilities of the rest of the team. The rest of the characters all feature useful abilities needed to help everyone else. One character has the ability to float in water, and another can be used as a trampoline to push others to greater heights. There are multiple abilities that each help to change up the way we progress within the game and force a greater level of thought, this meant that every time I thought I had seen everything in this game, I was surprised, suddenly a new character would show up with another ability that changed things for the better. I admit on a few occasions I did start to get tired of this game, but it was these moments where I would push forward and the game would throw in an entirely new idea that really changed the gameplay and made things feel unique again. At nearly every turn as I would feel myself losing interest suddenly I would receive a new character that had a reverse relationship with gravity or a double jump, but this was one of the games strongest points it constantly evolved right up to the end developing a surprisingly deep narrative and really strong gameplay. Each level in the game in derived from a simple means of getting from point A to point B, in the early game these are quite simplistic and easy, however the difficulty ramps up quite heavily the further along you progress, with new obstacles and dangers. I could never complain about the challenge and the further I got I enjoyed figuring out the best way to move my characters through the levels, the challenge never becomes overwhelmingly hard but there is certainly a challenge that keeps the game interesting. Another noteworthy point is the excellent narration (delivered by Danny Wallace probably best known as Shawn Hastings in Assassin’s Creed), while the gameplay is good, it is really the lively and enjoyable narration that carries the game. The story is full of life and exposition, even though our characters in the game are simply just squares and rectangles I felt connected to them thanks to the brilliantly detailed narration that carries through the game. 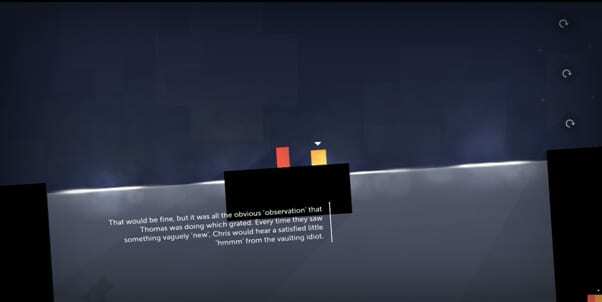 Thomas was not just a little rectangle, he was a thoughtful character who listed his observations and sought friendship, the narration plays well through the story and honestly, I loved getting into each level to hear every piece of information offered about the characters and their thoughts. Who would have thought a game could make me care about a bunch of squares and rectangles, I certainly never did. Thomas was Alone is an interesting game, and better still is the fact that its simplicity is just a small part of the game, its design may be simple and gameplay essentially generic but this is a game with a whole lot of soul and that is enjoyable. This is a showing that even if independent developers choose to go down the route of simplicity they can develop a truly great game with a deep and meaningful story, it also shows you don’t need an open world and plenty of violence to create a great experience that someone will want to go back to time and time again.